I had big plans to knit lots of things while we were travelling, but the weather in Italy was so hot that a lot of the time I didn't really feel like knitting on a humid train. 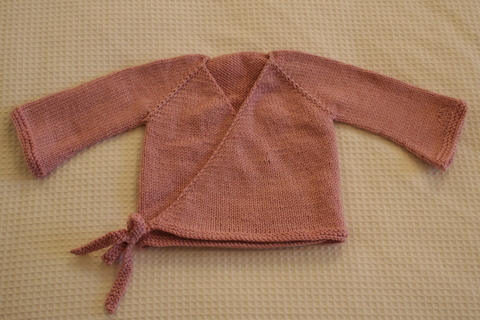 I did however manage to finish a kimono cardigan for my brother's baby, due in late October. They are having a girl and I will become an aunt for the first time. She will also be the first grandchild, so I can see she will be very spoilt. I used the 8 ply version of the seamless baby kimono pattern found here. The yarn is NZ Naturally Merino et Soie in a dusky pink. This is now my go-to yarn for 8 ply baby stuff. It's really soft and knits up well, and is cheaper that the other merino/silk blends I've found. The pattern itself is very clever - all knitted in one piece so there are no bulky seams and it knits up quickly. The sleeve in the 8 ply version is a standard sleeve shape, but I preferred the flared kimono-ish shape of the sleeve in the bulky (12 ply) version, so I created my own version of the flared sleeve for 8 ply weight wool. The details are below. With the right side facing, locate the centre bottom of the sleeve opening. Leaving a tail of 8 inches or so, pick up two additional stitches from the left of the opening and continue knitting the round, picking up two additional stitches at the end of needle 3 (40 stitches total). Decrease round: k2tog, k2tog, knit to last 4 st, ssk, ssk (36 stitches). Alternate purl one round, knit the next round for next 4 rounds. Note: you can choose not to pick up the stitches at the start and just knit 28 rounds of 36 stitches, but I tried it that way and I was getting holes under the sleeve. I think picking up the stitches and then decreasing them helps eliminate this. You can also fix up any holes when you weave the ends in - that is why I suggest leaving a long tail of 8 inches. Looks gorgeous, and you have plenty of time to make another! Gorgeous kimono! Must add to my list of things to make. Just to say thank-you for the link and sleeve adaptions, a gorgeous pattern. (I found your blog through flickr). I'll knit this up one day. Thanks!